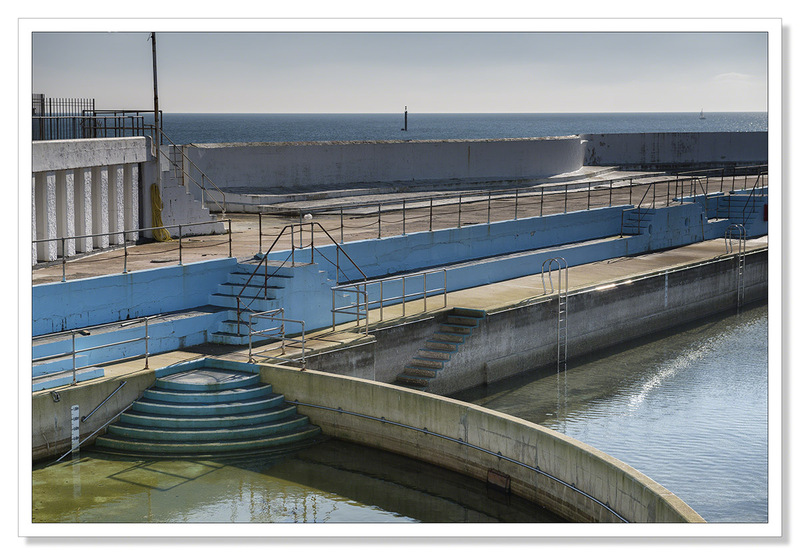 Just before Christmas I visited the Jubilee Pool in Penzance and was really taken with the beautiful Art Deco design of the pool. I was aware that funding had been found to restore the pool to its former glory following the devastating storms at the beginning of last year. The pool was opened in 1935 to mark the Silver Jubilee of King George V. Today, it is one of the few remaining 1930s lidos in the entire country. 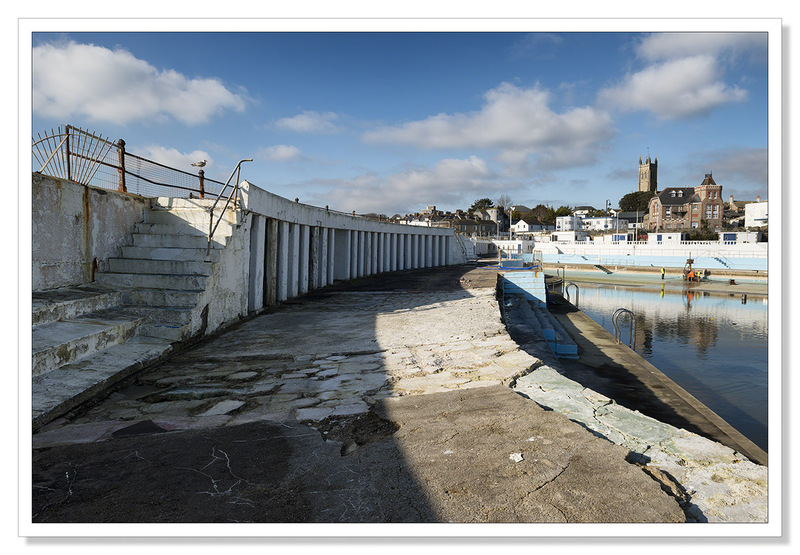 I was very interested in the future of the pool so I contacted the Mayor of Penzance and asked if I might be given access to take pictures of the pool, as it is now, before the restoration work begins. I was put in touch with a chap called James Hardy, Community Network Coordinator, who is overseeing and coordinating the work for Cornwall Council. I told James what I wanted to do, to capture the pool as it is now and to follow the work as it progresses over the next 12 months or so. The plan is that the pool will re-open in May 2016. My request was discussed at a meeting two weeks ago with the contractors who are carrying out the work and the Friends of the Jubilee Pool who are busy raising money to match funding from central government. I’m really pleased to say that I have been taken on as photographer for the entire project and I will be now be a regular visitor to the pool, cataloguing the work as it proceeds. I visited the pool on Monday and met Ashley Snell, a geo-technical engineer, who is currently surveying the pool. During the storms of last winter that I mentioned earlier, the force of the sea was such that the pool was lifted and moved from its anchorage on the bedrock beneath. It’s Ashley’s job to now carry out a survey to assess the full extent of the damage and to gather information on the rock the pool sits on. On Monday, drilling equipment was craned in and the process of drilling bore holes at different points around the pool has begun. Monday was a beautiful day with bright sunshine presenting a few challenges photographically, but also opportunities. I’ve a lot of pictures to go through and will be posting a gallery of those images soon but in the meantime, here are a few of the images I’ve processed so far. In the bright sunshine, looking at the pool, one could be forgiven for thinking just a lick of paint here and there would put things right. However, the reality can be seen in the third photograph, the pool has buckled and twisted under the force of the sea, almost as if an earthquake had struck.. This entry was posted on February 12, 2015 by Chillbrook. 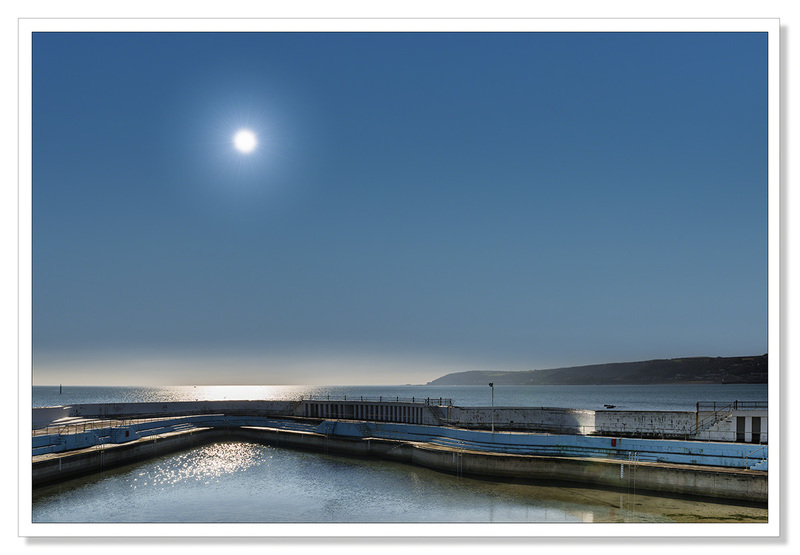 It was filed under Cornwall, Photography and was tagged with Adrian Theze, Cornwall, Cornwall Photographic, Cornwall Photography, Jubilee Pool Penzance, Lido, Nikon D800e, Penzance, photographs of Cornwall, Photography, Storm damage, swimming pool. Congratulations on being the official photographer. And I am so glad they are going ahead with the restoration, it would be a pity to lose such a lovely, historic landmark. Thank you Jude. It would have been a real loss had the money not been forthcoming. After all, in the grand scheme of things a couple of million is peanuts. We’ve lost far too many pools like this one and I’m so glad the Jubilee pool has been saved. That said, part of the deal is that the friends of the Jubilee pool match funding. They’ve got quite a lot of money to raise yet. I’m hoping that some of my photographs, prints and cards, might help to raise a little at least..
Stunningly beautiful, and well researched. Kudos on taking that extra step to find out. Great shots and very interesting post. Thanks very much Randall. A landmark that certainly deserved to be saved! It should be interesting and fun. Thank you Emilio. I’m looking forward to it! doing good! I look forward to the progress. I’d say Penzance is very fortunate that you had the vision for this project. What a great idea, Adrian, and great pictures. I’m really looking forward to seeing the transformation. So serene ! Beautiful image ! I admire your initiative and your commitment to this project; not all history worth preserving is centuries old. i look forward to more documentry, yet beautiful photos. Thank you very much Bunty. It’s going to be a fun project! Wow, what a huge job for them and such an exciting project all concerned and how fortunate for Cornwall Council to have you on board! It looks like a fantastic pool, but yes in need of some serious renovation. Congratulations with becoming the photographer for the whole project. That is really cool, and I look forward to seeing your pictures from the whole process. What an opportunity and what a great project! Good on you for making it happen. It’s incredibly satisfying being able to help a worthy cause with photography. Congrats in being selected as the photographer for the project. They’re very wise 😉 I’m looking forward to seeing the progression. Terrific. I wait with interest, for the photos so come. What a fascinating project, Adrian! Beautiful images and I look forward to the process images too. Swimming pool architecture fascinates me. But this is not just an ordinary pool, it’s a part of the history! The location is really nice and so close to the sea – I have never seen a place like this. Well, I should really visit the UK! It’s essential that the pool will be reconstructed and I am very curious about the updates. This awesome space deserves everything but being neglected. Although it has its charm like this, I am sure it will become a popular place after the renovation. Thank you very much for your comment. The Jubilee Pool really is very special. I feel very honoured to have been given the job of documenting the restoration of this wonderful piece of Art Deco architecture. Too many pools like this have not survived but, thanks to a lot of people who have done a tremendous job in ensuring that it will be saved from the accountants who only see figures and bottom lines and not beyond, there is a future and I’m sure the pool will once more become a very popular attraction in Penzance for both local people and for summer visitors.